When the Nobel Prize Committee awarded Elie the Nobel Peace Prize in 1986 the choice was greeted with international acclaim, for it is difficult to imagine any other person in the world who had so commanded the respect of political leaders and the people themselves. As for myself, Elie has always been my teacher, mentor, role model, inspiration, and friend of 50 years - in a word, the most remarkable human being I have ever encountered. It is a humbling and moving moment to participate in this remembrance of Professor Elie Wiesel - where Elie Wiesel's life's work, indeed his life, is a source of learning and inspiration for us all. For we are here to remember, and celebrate the life of a tzaddik, an authentic righteous person who has come to symbolize and embody the conscience of humanity - not only by and for Jews, but by and for humanity as a whole. Indeed, when the Nobel Prize Committee awarded Elie the Nobel Peace Prize in 1986 the choice was greeted with international acclaim, for it is difficult to imagine any other person in the world who had so commanded the respect of political leaders and the people themselves. As for myself, Elie has always been my teacher, mentor, role model, inspiration, and friend of 50 years - in a word, the most remarkable human being I have ever encountered and had the honour to work with in common cause. -	The danger of forgetting and the imperative of remembrance. As Elie put it in his first classic work, Night, "to forget would not only be dangerous but offensive; to forget the dead would be akin to killing them a second time"
-	The danger of silence in the face of evil - the imperative of standing up against injustice. As Elie put it in his 1986 Nobel Prize lecture, "We must always take sides. Neutrality helps the oppressor never the victim, silence encourages the tormentor never the tormented... wherever men or women are persecuted because of their race, religion or political views that place must - at that moment - become the centre of the universe." And he added: "there may be times when we are powerless to prevent injustice, but there must never be a time where we fail to protest against injustice." -	The danger of state sanctioned cultures of hate - the responsibility to prevent. The enduring lessons of the holocaust, and the genocides that followed in Srebrenica, Rwanda and Darfur - where Elie sounded the alarm again and again - is that the Shoah, and these genocides, occurred not only because of the machinery of death but because of state sanctioned ideologies of hate. It is this teaching of contempt, this demonizing of the other, this is where it all begins. -	The danger of indifference and inaction in the face of mass atrocity and genocide - the responsibility to protect. What made the Holocaust and the genocide in Rwanda so unspeakable was not only the horror of the genocides themselves but that these genocides were preventable. We knew and we did not act, just as we knew and did not act in the genocide in Darfur, and just as we know and have not acted in the mass atrocities in Syria. As Elie warned us again and again, indifference in the face of evil is acquiescence with evil itself - it is complicity with evil. -	And as Elie would add: "It is our responsibility to confront evil, as Raoul Wallenberg did, to resist it, to expose it - particularly when evil masks itself under the cover of law." For let us not forget, on this the 80th anniversary of the Nuremberg Race Laws and the 70th anniversary of the Nuremberg Trials, that the Nazis committed mass murder under the cover of law, aided and abetted by the Nuremberg elites - doctors, lawyers, judges, educators - la trahison des clercs. -	The danger of anti-Semitism; simply put - 1.3 million people were deported to Auschwitz, 1.1 million of them were Jews, of which Elie was one. One million of them were murdered, including Elie's parents and sister. But let there be no mistake about it. Jews died at Auschwitz because of anti-semitism, but anti-semitism itself did not die. And Jew-hatred remains the canary in the mineshaft of global evil that threatens us all. May I close on a personal note: As my colleague John Roth once wrote - "in allowing me to enter his life, Elie has given meaning to mine." 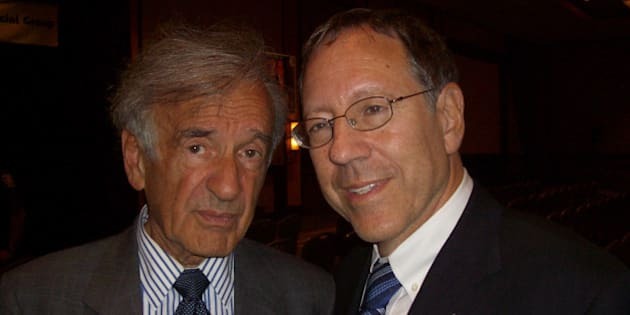 Elie Wiesel as a conscience of humanity has impacted on all of humanity - not as an abstraction but on people individually in their daily lives - as he has in my own life and work. -	Where as a student I became involved in the struggle for Soviet Jewry on reading Elie's classic work in 1965 on "The Jews of Silence," where he was referring not to the Jews silenced in the former Soviet Union, but to the silence of Jews in the free world who were not standing up to that injustice; and where his clarion call mobilized generations in that struggle, and where we had our first of lifelong encounters. -	Where as a human rights lawyer I was inspired by his passion and commitment to tikkun olam - the betterment of the human condition - in the best sense of the word. -	Where as an MP he was for me as for parliamentarians worldwide, an inspiration in our work. And so, on this occasion, the best remembrance, and the best tribute we can pay to Elie Wiesel, is to commit to action, such as that which found expression in the "Never Again Declaration" that we adopted in the International Legal Symposium at Jagiellonian University in May 2016 where Elie acted as our Honourary Chair, one of his last public acts. The closing excerpt from this Declaration is as follows: "...That never again will we be indifferent to incitement and hate. That never again will we be silent in the face of evil. That never again will we indulge racism and anti-Semitism. That never again will we be indifferent to the plight of the vulnerable. That never again will we be indifferent to mass atrocity and impunity. But we will speak and we will act against racism, against hate, against anti-Semitism, against mass atrocity, against injustice - and against the crime of crimes we should even shudder to mention - genocide." And yes, as Elie would remind us, always against indifference. For in what we say, and more importantly in what we do, we make a statement about ourselves as a people, we make a statement about ourselves as people. For now more than ever, "qui s'excuse, s'accuse". Whoever remains indifferent indicts himself or herself. Irwin Cotler is a Professor of Law Emeritus at McGill University and Former Minister of Justice and Attorney General of Canada, who recently founded and chairs the Raoul Wallenberg Centre for Human Rights, where Elie Wiesel was it's honourary Co-Chair and guiding inspiration.